There is an herb in my local materia medica that is not native to my area, does not grow wild, isn’t hardy here in New England, and isn’t perennial—it requires annual seeding in the garden and is sensitive to frost. Despite these limitations, I am undeniably, profusely, and irrevocably in love with holy basil, and it will always hold an esteemed place in my herb garden. Holy basil is a member of the mint family, Lamiaceae, which includes many of our familiar culinary herbs. It has the familiar square stem, opposite leaves, and irregular white to pink to purple flowers that members of this family have (remember the mint family botany we talked about in the motherwort article?). Mint family plants have something else in common—their aromatic volatile oils, and holy basil is no exception. Its scent is sweet, joyous, pleasureful, and intoxicating—one might even describe it as divine. Each time I walk by my holy basil plants, I stop and plunge my hands into their foliage and bring their scent up to my nose—the sweet, heady smell is a welcome invitation for a moment of respite and rejuvenation. I’m not the only one who flocks to holy basil—indeed, bees love it as much as I do! Holy basil is quite easy to grow from seed. You can start seeds indoors in spring and set transplants out or direct seed after danger of frost has passed. When direct seeding, make sure the soil has truly warmed up for best germination and plant growth. Holy basil also grows well in pots. Being from tropical regions, holy basil grows best in warm, sunny conditions, preferring at least eight hours of sunlight per day, well-nourished, fertile soil, and regular watering (Strictly Medicinal Seeds, 2016). When grown in tropical areas, holy basil is a small perennial shrub. In temperate regions, holy basil can be grown as an annual, and Strictly Medicinal Seeds (2016) suggests that Kapoor is the easiest holy basil cultivar to grow in temperate climates. Note that holy basil will sometimes self-seed itself the following year, which explains the holy basil plant growing at the end of my Calendula bed, which was where I planted holy basil last year. Interestingly, Strictly Medicinal Seeds conducted a “snapshot” analysis of holy basil cultivars during the early flowering stage for the main active constituents, rosmarinic acid, and eugenol. Their tests showed that Krishna had the highest total level of these active constituents, followed by Vana, Rama, and Kapoor (Strictly Medicinal Seeds, 2016). Ultimately, potency will vary not only with variety but also the growing conditions in your garden and the stage at which you harvest, and you can grow different holy basil varieties and decide which you prefer. In Ayurveda, holy basil is considered a Rasayana herb, one that “nourishes a person’s growth to perfect health and promotes long life” (Winston & Maimes, 2007). In Western herbalism, holy basil is considered an adaptogen, helping the body respond in a measured way to stressors (be they physical or emotional), thus reducing the negative effects of stress on physical and emotional health and providing balance. Holy basil’s antioxidant, neuroprotective, and radio-protective actions are considered protective and anti-aging (Winston & Maimes, 2007). The languaging may be different between the two traditions, but the tonic, health-supporting effect of holy basil is the same (Herbal Academy, 2016)! Holy basil has many other actions, as well. As a digestive stimulant, carminative, and antispasmodic due to its volatile oil content, it is supportive of digestion and digestive health. Its antiviral, antibacterial, decongestant, expectorant, and diaphoretic actions are helpful for respiratory ailments (Wood, 2008). In India, holy basil is used as an expectorant tea for bronchial mucus (Winston and Maimes, 2007) due to its ability to warm and clear stuck congestion. As an immunomodulator, holy basil strengthens and balances the immune system. I love holy basil as a nervine. Its aromatic oils relieve tension, calm, and uplift the emotions. As an adaptogen, I feel that holy basil is grounding, as well, so it helps me plant my feet solidly on the ground while it helps my heart open and my spirit lift. It is lovely in daily nourishing tonic tea blends (perhaps in an adaptogen chai blend) or after dinner in a more calming tea blend with other nervine herbs. We typically use herbs for their tonic or other benefits and are very studious and serious in our interactions with them. Holy basil invites us to move beyond that mindset and explore the use of herbs for joy and pleasure, like we do with cacao, rose, or lavender. Holy basil’s heart opening nature and exhilarating scent inspire playfulness and an appreciation for the gorgeous possibilities of connection with the plants. Holy basil uplifts the heart and emotions and is a sweet, sweet friend. I was once gifted a bottle of tulsi glycerite from an herbalist after I had fallen in love with an extensive patch of blooming holy basil just buzzing with bees. This palpable sound of connection and reciprocity was quite moving! Each time I used that precious glycerite I was transported back to that experience, filling me with joy. Holy basil glycerite is now a must-have pleasure medicine in my herbal apothecary! Learn how to make a fresh herbal glycerite here. Holy basil glycerite is wonderful in hot chocolate, yogurt, and smoothies. Just a bit of glycerite brings a lot of flavor, so you don’t need much! 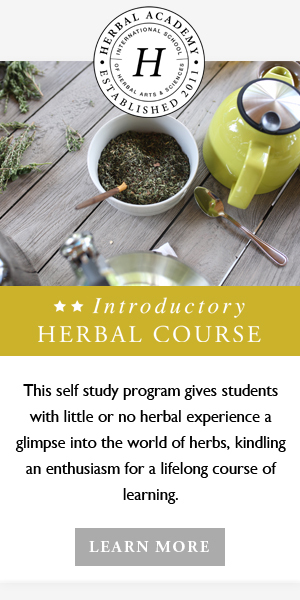 Are you interested in learning more about holy basil? The holy basil plant monograph in The Herbarium includes additional discussion on holy basil’s therapeutic actions, energetics, and the body systems and imbalances which it can support. Winston, D. and Maimes, S. (2007). Adaptogens: Herbs for Strength, Stamina, and Stress Relief. Rochester, VT: Healing Arts Press.